When you start thinking about water activities for the summer, what comes to mind? Is getting the boat ready for skiing first on your list? Do you consider buying a new swim suit? Do your plans include life vests for all the family members? These and other questions arise early in spring as families prepare for some outdoor relaxation and enjoyment in the months ahead. But too often one of the family members is left out of the plans for having fun in the water. 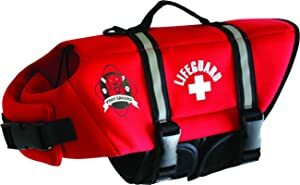 If you always take your pet along with you on holidays and weekends, you should consider purchasing a life jacket for your canine friend as well. The answer to this last question can be answered with a statement, based on the experience of families and hunters who are accompanied by the canine on a regular basis. Life jackets are important, even if your dog is a strong swimmer. Many dogs die each year in lakes, rivers, even swimming pools. Sometimes, this tragedy is due to weariness, and other times they lose their lives because of water temperature. 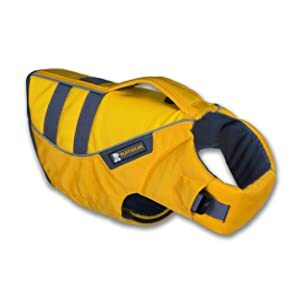 In any case, it’s best to plan to keep your dog safe with a quality life jacket. Some dog breeds are naturally better swimmers, while others don’t do well in the water. Breeds like the Boston Terrier and the Bulldog tire quite easily because of their body structure, for example. It’s best not to assume your pet is going to be able to survive in the event of a problem that puts them in the water. Hunters, on the other hand, may be able to allow a well-trained retriever or another hunting dog to go without the jacket. However, it’s always better to be safe. The key is to protect your dog when you are in open water. They do get tired and they can choke on water just as a human might. Take some time to shop for the right life vest or jacket for your dog and get added safety with a reflective surface. The question, of course, is how do you choose the right jacket or vest for your dog? To make this decision, start by being honest about the type of dog you have, so you understand the physical ability they have. Some dogs are good swimmers, though this doesn’t mean you should dismiss the idea of a safety vest of life jacket altogether. 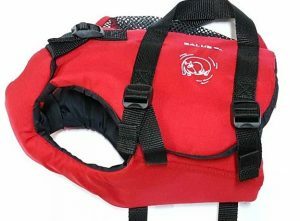 If you plan to have your dog with you when boating, you should have a canine life jacket for them. This is especially important when you get into open water while fishing or skiing, for example. Dogs can have difficulties after a boating accident or when the watercraft capsizes, just as people will. Remember, even people who are good swimmers wear life jackets, and they should. Consider these key reasons for having a vest or jacket for your canine companion. Most dogs have a smaller amount of body fat so they won’t float well. They aren’t buoyant and will have to expend a lot of energy to stay afloat. 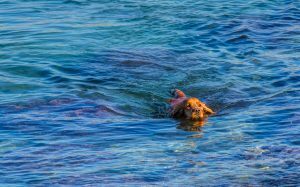 If your dog fall into the water because of large waves and rough surface, it will be difficult for them to survive. The strongest dog, even one trained for water activity like hunting and retrieving, can become fatigued and can get into difficulty unless they have the help of a jacket. If your dog is very young or a bit older, they will become fatigued more easily. In addition, it the dog jumps into the water or falls into the water it will be easier to retrieve them when you can grab onto the vest or jacket and pull them in. 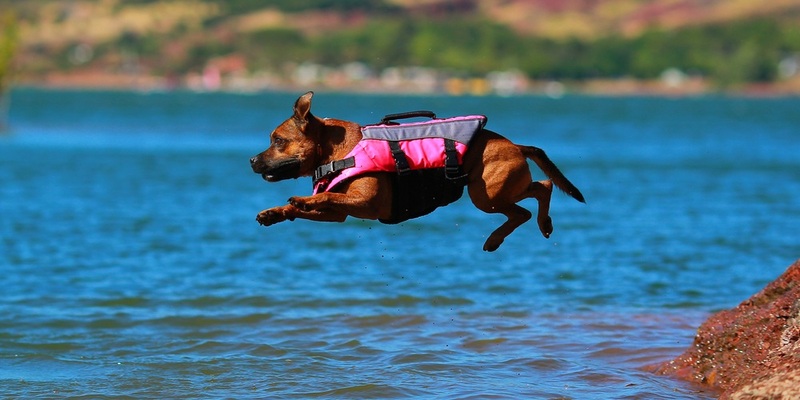 Choosing the best life jacket for your dog begins with accurate measurements. You should take the time to get good numbers for body length. Measure from the base of the neck to the point where the body slopes down at the rump. Next, measure girth, which should be measure behind the front legs and again a bit further back on the body. A third measurement should be taken around the neck. When you’re trying various jackets or vests, be sure to loosen all the straps and buckles so it’s easier to put the jacket/vest on. Lay the jacket on the dog’s back and connect the neck clip, leaving it comfortably loose, but not too loose. As with a collar, you should be able to slip your finger under the strap comfortably. 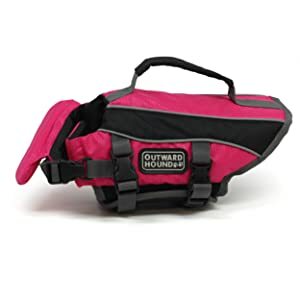 Get the best coverage you can on the dog’s back and connect the chest straps for a fairly snug fit. The back straps should be what keep the jacket in place, not the neck strap or clip. Don’t make the mistake some owners do and just take one that “looks right” off the shelf. This is going to be an important purchase for you and your dog, so take some time to find the one that fits as it should. Don’t depend on small, medium and large to be good enough. For example, a vest or jacket with a high collar probably won’t work well on a dog with a short neck and stocky build. Try the vest or jacket at home, to see if your companion can move and walk with comfort. Make sure the jacket doesn’t rub and cause sores while it’s in use. These products are generally made with handles too, so make sure you know their location before you go out onto the water. Like the jacket or vest for a human being, it’s important to keep water away from the dog’s mouth and nose. Your dog should be able to float and paddle without stress. Some might apply the words “almost perfect” to this life jacket for the canine set. Even if that takes it a bit too far, it is quite popular among dog owners and fits well in the list of top products. You’ll have a choice of colors – blue, yellow and red – each with reflective trim. Buckles are easy to use on this nicely designed jacket. It has a bit lower profile than others in the class, but provides a loop for a light so you can track your dog in low light and in the dark. 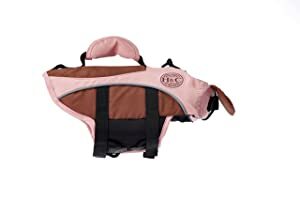 If you’re going to shop for a quality life jacket for your dog, you may as well begin with the product that is, by some counts, the best-selling item in this category. Durable and dependable would be two good words to describe this jacket, with both side handles and top handle for rescue. Naturally, it’s adjustable and has front-float assist as well. You’ll like the bright color, quick-release buckles and the belly-band of long-lasting neoprene. It comes at a reasonable price and will get high marks from you for overall value. Top handle too far forward? Heavy-duty polyester and great flotation performance are the highlights of this jacket. It comes with zipper pocket, straps that are easily adjustable and convenient grab handle. Available in yellow and red with reflective trim, with an array of sizes offered. The neoprene straps provide a secure fit. Might be a good choice for small dogs. Fit for Bulldog or Pit? 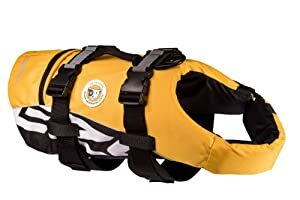 If there is one way to describe this life jacket for the canine, it would have to be “very buoyant.” It should hold the dog’s chest and head up quite well, and also has a broad strap for the chest and neck. The extra flap under the dog’s chin will be very helpful too. Made with Ripstop nylon so it should stand up to regular use. The reinforced grab handle and strong stitching also make it suitable for extended use. This neoprene jacket should be reliable for regular use, with reflective strips available and a convenient grab handle. Owners will appreciate the quick-release buckles and a roomy neck/chest opening. The Velcro closures are convenient as well. The mesh area for the belly make the jacket more “breathable” and should keep your canine more comfortable. This company started with life vests for humans and now makes a popular jacket for dogs as well. The design includes a foam area that covers the belly, sides and chest, which the company believes provides superior flotation for a dog. Mesh pocket is handy as are the two grab handles. Available in blue or red. To find the right life jacket or vest for your dog, you should take a bit more time for accurate measurements. Fit is all-important when providing a dog with buoyancy in the water. 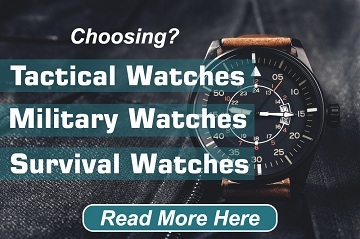 Some products on the list indicate issues with seams and stitching, though this doesn’t apply to all products from the manufacture. Some jackets provide a bit more buoyancy because of a unique ingredient. You’ll probably find this is true with the Salus “foam zone.” Others might be a good choice for the smaller dog, because the company offers extra small size (EzyDog). The Kyjen Outward Hound enjoys widespread popularity, if you judge by the number of units sold. The best advice you can get when shopping for a life vest or jacket for your canine is this: Don’t just take the first one that catches your eye on the shelf. Color is important for visibility. Saving your dog’s life should not depend on a fashion decision. Measurement and fit should be the key, along with your ability to retrieve your pet from the water using the provided grab handles. Price shouldn’t be a major issue for most dog owners, though you will find products in a range from $25 to $80, any of which might provide the performance you’re looking for. Be sure you don’t select your life jacket based on price alone. If you do, you may find yourself with more problems than you anticipated. Keep your dog safe when you take him on the water.